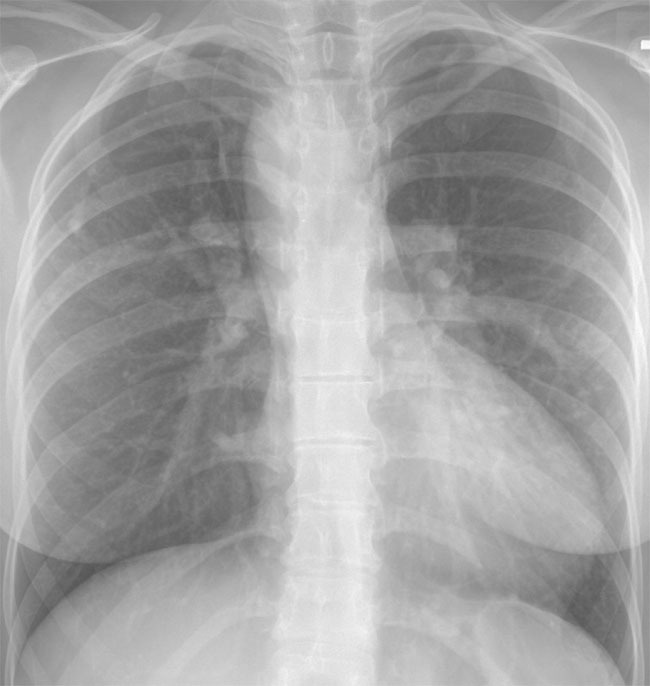 A. PA chest radiograph in the first week of life demonstrates cardiomegaly with a right aortic arch. There is pulmonary undercirculation as pulmonary vascular resistance is still high. Angio-cardiogram shows simulatenosis falling of aorta and pulmonary artery. 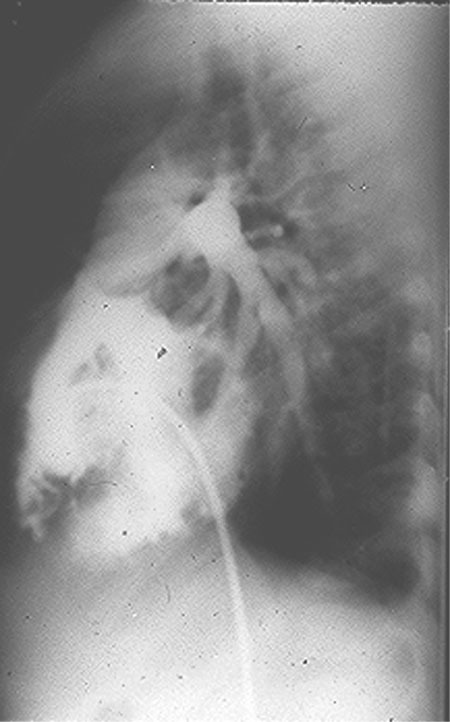 Lateral view shows pulmonary artery arising from aortic trunc. 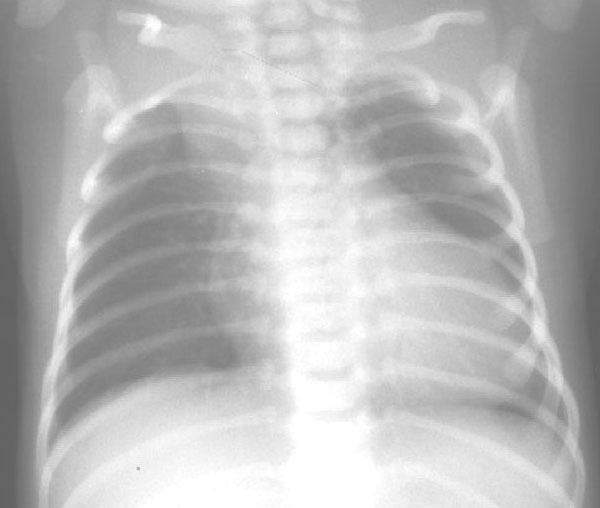 B. PA chest radiograph of an older child. There is marked increase in pulmonary vascular markings as pulmonary vascular resistance has fallen. The superior mediastinum is widened. Note the high take-off of the pulmonary arteries. This lesion was first described by Wilson in 1798. It was Lev and Saphir who provided the first definition in 1942 of truncus arteriosus as a single trunk leaving the heart, which gives rise to the aorta, pulmonary arteries and coronary arteries. Truncus occurs in approximately 1-4% of patients with congenital heart disease. Without surgical treatment mortality is 80% by one year. Anatomy: Truncus is characterized by a single large vessel which overrides an outlet perimembranous VSD and gives rise to the aorta, pulmonary arteries and coronary arteries. 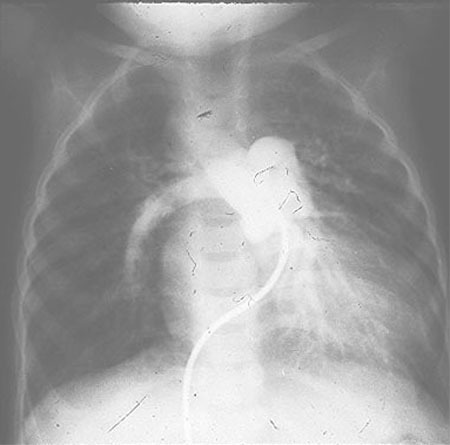 The VSD is usually leftward and anterior, in the supracristal position or within the crista. Type I: a short main pulmonary artery segment arise from the aorta which then branches into both pulmonary arteries. Type II: both branch pulmonary arteries arise from the common arterial trunk close to each other usually with a rim of truncal tissue between them. Type III: the branch pulmonary arteries arise from either side of the truncus and are remote from each other. Type IV: this is considered a form of pulmonary atresia, with collateral vessels arising from the descending aorta supplying the lungs. The truncal valve leaflets are often thickened secondary to expansion of the spongiosa and fibrosa layers of the leaflets. There may be 2-6 truncal valve leaflets. The incidence of truncal valve stenosis is 30% with truncal insufficiency reported in up to 50% of cases. The coronary arteries are often abnormal with the left often arising from a higher and more posterior position and occasionally the presence of a single coronary artery. Associated lesions: The most frequent anomalies are a right sided aortic arch (1/3 cases), an interrupted aortic arch (19%)- type B between the left carotid and left subclavian arteries being the commonest.